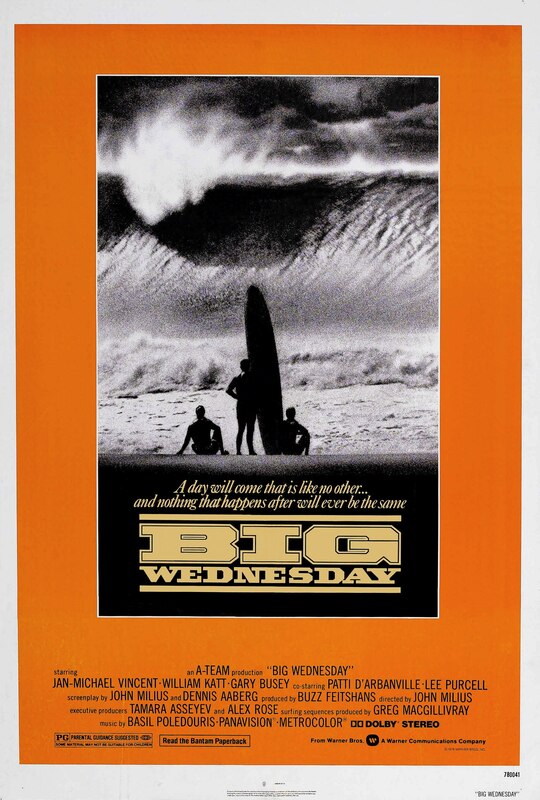 A labour of love for its director (whose own experiences formed the basis of the script, co-written with fellow surfer Dennis Aaberg), Big Wednesday is a coming-of-age tale that slowly, and almost remorselessly, develops into a melancholy examination of the passing of an era. It’s no coincidence that Milius begins his movie in the early Sixties, a time of enormous promise in the US with Kennedy’s presidency in full swing and advances being made in relation to civil rights, and the movie reflects the mood of the country in the actions and the behaviour of its central trio; they’re young, they’re brimming with confidence, and (as far as they’re concerned) they’re invincible. The folly of youth is depicted with a bracing honesty, Milius acknowledging through his characters his own innocent naïveté, and as the friendship between Matt, Jack and Leroy fractures and sends them on their separate paths, the movie offers a wistful commentary on the perils of expecting things to always remain the same. The spectre of the Vietnam War hovers over the friends’ journey into adulthood, altering them in different ways (as it did the country), and swiftly neutering the confidence and vitality they had just a few short years before. Milius details all this with a compassion that reflects the confusion that many were feeling during the late Sixties and early Seventies. 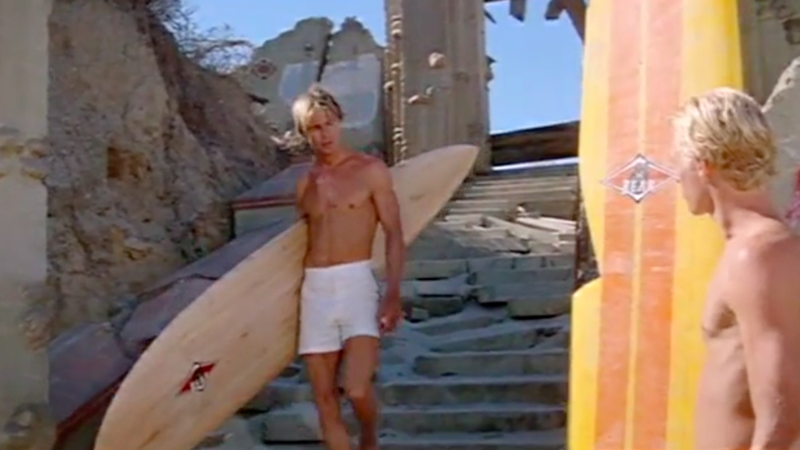 It’s this sense of an era changing direction, and not necessarily for the better, that drives the narrative and through the battered camaraderie of its central trio, allows the viewer to understand just how and why surfing was so important an avenue of escape for so many young men and women. But the surfing is just the backdrop to the much more important of the friendships forged in the swells and on the beaches, a sub-culture that has its own aristocracy (Matt, Jack and Leroy), but which is doomed to be superseded by a new, younger generation (as represented by real life surfer Gerry Lopez). With an elegiac feel to its final section that allows for an emotional intensity as the three friends reunite to say goodbye to their younger selves. It’s probably Milius’ most personal movie to date, and his passion and commitment is evident in every scene. With instinctive and intuitive performances from Vincent, Katt and Busey (all three never better than they are here), and breathtaking surfing imagery courtesy of Bruce Surtees, the movie has a telling sense of the era it’s depicting, and Milius laces it with enough nostalgia to make viewers – even the casual ones – wish they’d been a part of it at the time. Rating: 8/10 – with its themes of loyalty and youthful hopes dashed by hard lessons learned and the inevitable burdens of responsibility, Big Wednesday is a movie with more going on under the waves than most, and which, thanks to Milius’ distilling of his own past into the material, resonates with affection for, and understanding of, its unsuspecting characters; ambitious in its scope (though not as mythic as Milius was probably aiming for), and deftly handled by its usually bullish director, this is a cult classic that deserves its hard-won status (it was a flop on its original release), and which represents a high point in the world of fictional surfing movies.